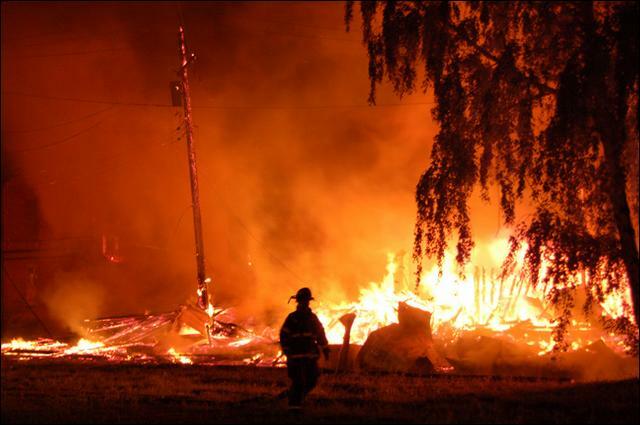 ASHTABULA � Arson investigators searched through rubble and ash Monday morning of what was a massive fire hours earlier at a former lumber yard on the city�s West Side. The 12:55 a.m. fire engulfed the former Dodge Lumber complex, 615 W. 48th St., according to Ashtabula Fire Department reports. The first responders were on the scene within four minutes of receiving the first call of the fire, reports show. Ashtabula firefighters set up water hose streams at West 48th Street and Foster Avenue, reports show. An additional engine and ladder company were called to the scene at 1:10 a.m., as well as all off-duty city firefighters, reports show. Ashtabula Township�s Ladder Company set up on Center Street and Geneva and Saybrook fire departments provided the water by stretching hose lines to Park Avenue at Center Street, reports said. Ashtabula Capt. Lyle Hare said five engine companies, two ladder companies and 34 men fought the blaze until 7 a.m.
At about 2:15 a.m., electrical power was cut off from the Ashtabula Gulf to West 58th Street. First Energy arrived to restore power to the area shortly thereafter. Two city fire companies and a fire investigator stayed on the scene until 11 a.m.
A city public works crew arrived on the scene at 8 a.m. to clean up the debris from the street. The fire gutted the former lumber yard and slightly damaged the building across the street � the Phoenix Machine Co. The fire is under investigation, and the building�s owner and insurance status is being researched, Hare said. �Ashtabula Fire Department would like to acknowledge the support and assistance of the mutual aid companies as well as Domino�s Pizza that opened their store and delivered food and cold pop to the firefighters,� Hare said.